25″ high.13 3/4″ wide.5″ deep. Made with solid wood and wood veneers, the Bulova Ashford Old World Clock is a handsome clock that has been given an Old World walnut finish. Its aged dial features both Roman and Arabic numerals that work with the spade hands in order to tell the time. 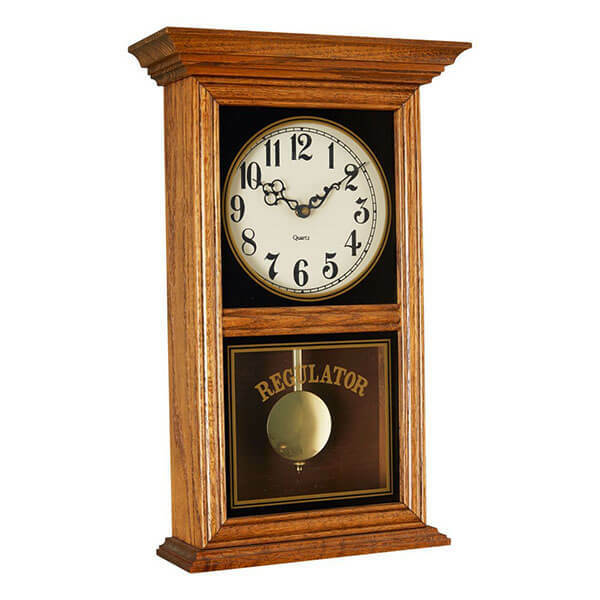 Classically designed, the River City Clocks American Regulator Wall Clock is fit for any room in your traditional home thanks to its light brown, oak finished cabinet. It offers a German quartz movement that keeps the time accurately and Ave Maria/Westminster chimes that ring out every hour on the hour. The wood is crafted and finished in a rich espresso finish. The movement allows you to play 6 melodies, an hourly Westminster chime, a quarterly chime, or 3 Christmas melodies. 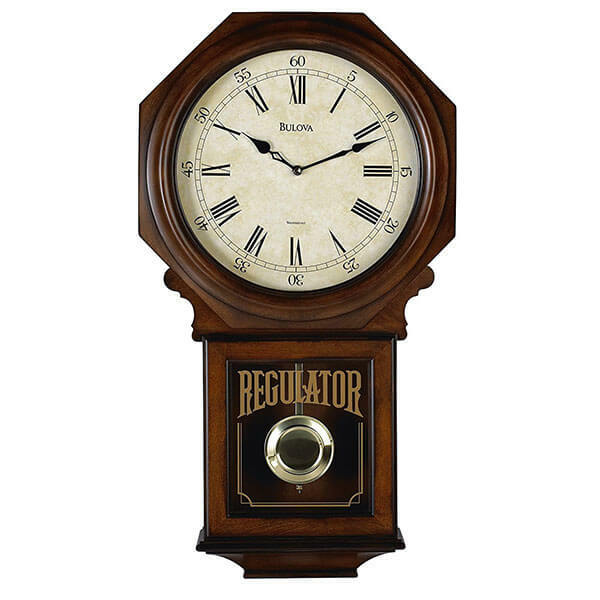 The Examplar Wooden Musical Schoolhouse Regulator Wall Clock is a traditionally styled schoolhouse clock that is made from durable wood. The wood has been given a rich espresso finish which allows it to match any decor. Inside, there is a quartz movement. There are chimes at every hour and quarter hour. The Maple’s Traditional Plastic Wall Clock with Pendulum offers the appeal of natural wood with the dependability and durability of plastic. 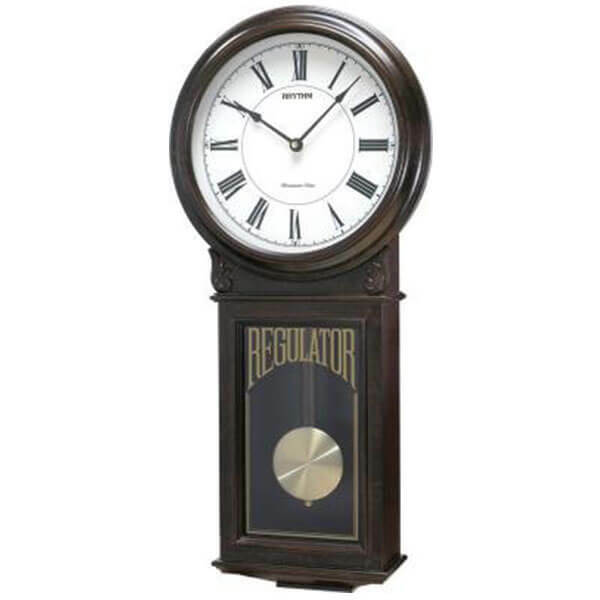 This clock features a sweep mode second hand for fluidity as well as a pendulum movement. A melody will sound off every hour on the hour. 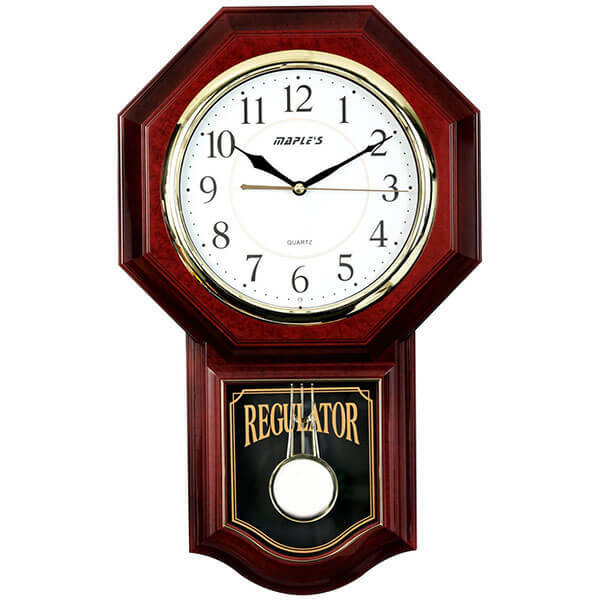 With everything you need to put it together included, the Dearborn Regulator Wall Clock Kit is a fun and traditional clock that looks good against any wall. 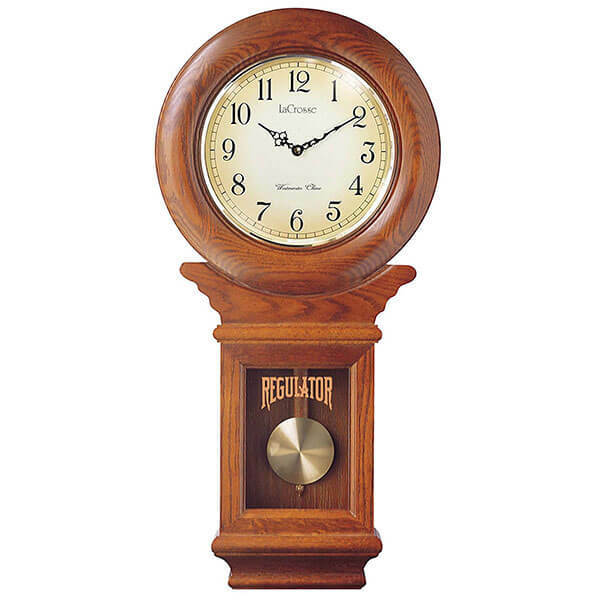 This clock is made out of solid oak and is able to be finished in your choice of stain or paint. Chimes on the hour, and indicates hour with an additional chime. Chime can be disabled. Requires 4AA batteries, not included. 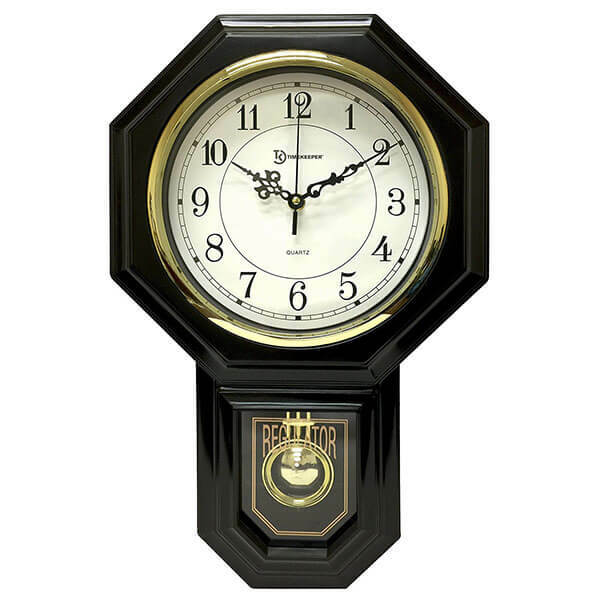 With its elegant blend of black and gold tones, the Timekeeper Essex Westminster Chime Faux Wood Pendulum Wall Clock is suitable for any sophisticated space. It features a chime every hour, which can be disabled for when guests are staying over, and a smooth, sweeping second hand for a fluid appearance.